This training section is tailored to Partner and Resource Mangers working with building and maintaining network with partner companies. Successful partnerships between companies is more likely to create more business opportunities (in Cinode called projects/assignments) and Cinode will help you to facilitate the communication of these opportunities by using the application. We will show you how to maintain a record of all the partner companies in your network. You can also invite partner companies to join your network - in effect creating a Cinode account for them. You will be able to announce roles to the relevant partners in your network and your partner will be able to respond. 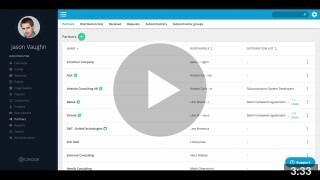 The videos for this section is grouped into a playlist below and will show the functionality of our module "Talent Partner". Read more about Talent Partner in the FAQ under "Partner". You will learn how where to find your partner companies, grouping companies into distribution lists and the general functionality for managing the network. You will learn to how to create a partner company and then how to invite them to your network in Cinode. You will learn to view incoming requests from your network and how to send new requests to selected partners. Note: Some of the functionality describe might benefit further from using the partner module in combination with our Business module. Read more about Business (click link).